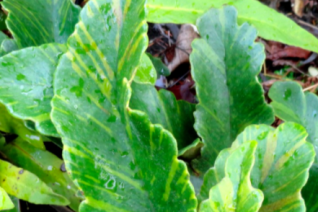 Variegated tongue fern. So called for the tall oblong shaped evergreen fronds that rise up vertically. This form has new growth marked with chartreuse stripes that fade a bit with maturity. Spreads to form colonies by furry stolons on the surface of the soil. Rich, well drained soil in part shade to dense shade. 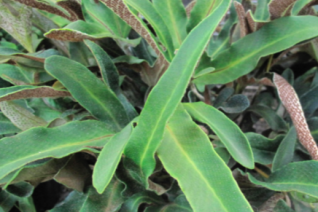 A great evergreen presence for really dry, dark spots. Avoid hot sun. Regular summer water increases the growth rate which is typically slow. May suffer some damage in the coldest winters (below 10ºF) remove those fronds and more will appear. Mix with other denizens of the dark- Aspidistra, Ophiopogon etc. Moderate deer resistance. Taiwan.